I love living in a small town, I truly do. That’s why I’ve spent my 53 years living in the same town I was born. I love that a short trip into town for even just a loaf of bread can mean running into people I used to work with, old neighbors, relatives (we’re all related I believe! ), and even friends from my childhood. Going to school, K-12, all on one campus means that you know everyone within at least 10 years of yourself – or their brothers and sisters. But a lot of the time, living among people who know you so well is a two edged sword. Even those wonderful moments of reconnection can take an ugly twist. The questions start with seemingly sincere concern, like “Have you seen Jane lately? What’s she doing these days?” No matter what your answer, the next question seems to always lead to their true inquiry, “You know I heard that she….” Oh, just fill in the blank! Has a drinking problem, got a divorce, was running around on her husband, got fired from her job, and so on! Frankly, I hate gossip. I don’t talk to many women or gather with them because I know we are the species that usually does this. That’s not to say men don’t as well, but geez ladies, can we just admit that we do have that tendency? We love to judge each other! We love drama! We love to talk and get attention! 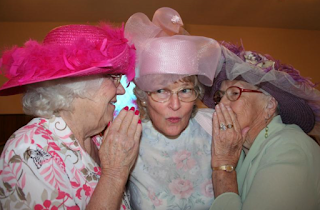 And somehow we’ve come to the conclusion that gossip is interesting conversation and we just blab…and blab…and blab! And then comes the next ‘car on the gossip train’, the next acquaintance into the grocery store or the doctor’s office. And we spread it a little more, retelling what we were told, often under the label of a “prayer concern”. Oh, now don’t tell me you don’t know what I mean! “Please remember Jane when you pray. I don’t know if you’ve heard or not but…” Really now. How ugly! Then that person turns the isle, and sees someone they know and before you know it, the whole town is talking about Jane. I sometimes wonder what a day at the grocery looks like to those that work there! Here’s the thing. If you live here long enough, eventually you will be Jane. You will be the subject of those conversations. It’s a given. I know I’ve been the subject a few times, and frankly, I was over it about as fast as it started. I don’t value the opinions of people enough to care - and I do know that the opinion of God is all I need to worry about. Yet, our reputations do matter. Those rumors effect our ability to serve Him. Consider that. Consider that the words from your mouth damaging the work for God that person can do. Do you want to be held accountable for that? How will you feel when you get to Heaven and God says, “Remember when you cut down Jane? Well those words you spoke were also carried by 129 other people. One of them knew your son Bob. While Bob was destined to marry Jane, and she would have lead him to Christ, he was turned against her by that rumor, and it never happened.” How about that scenario? How will you feel knowing that you harmed those you loved – not just Jane? If that doesn’t make you think, maybe this will. Living in a predominately Christian town, we’ve all heard Luke 6:37, which says “Judge not, and you shall not be judged. Condemn not, and you shall not be condemned. Forgive, and you will be forgiven.” But have we ever really read it? Have you ever really heard what is being said? “Judge not, and you shall not be judged.” God only has the power to judge, and He is merciful. But if we want to take on that authority, He will judge us accordingly. Matthew 7:2 says “For with what judgment you judge, you will be judged; and with the measure you use, it will be measured back to you”. Have you talked about someone who told a lie? For goodness sake, be sure you’ve never told one. Have you talked about someone’s drinking getting out of hand? Oh be sure you stay sober! God’s memory never fails. “Condemn not, and you shall not be condemned.” Mercy isn’t just something God gives. It can also be given by us. Those that are merciful receive mercy. Matthew 5:7 says “Blessed are the merciful, for they shall obtain mercy.” Or perhaps you don’t think you need mercy? Oh, Father God, open the eyes of anyone who doesn’t think they do! I myself need an endless line of dump trucks full of mercy, lined up and emptying out on me every single day - from God and people. But our condemnations never cease. It’s not always something big. Sometimes it’s small comments about appearance, how we should raise our kids, or how messy our house is. Small things turn into big things sometimes. Romans 2:1 says that in whatever way we judge others - it’s in that same way we condemn ourselves. “Forgive, and you will be forgiven.” I think this is the part of Luke 6:37 we overlook, or undervalue, most. We’re all going to disappoint each other from time to time. Sometimes those disappointments are going to truly hurt. Husbands and wives can disappoint each other. Brothers and sisters, neighbors, best friends, we’re all going to screw up and when we do, it often affects others. The fact is, sin is never personal. It always hurts someone else. But if you want God’s forgiveness, you have to forgive each other. In Matthew 6:14-15 Jesus says, “For if you forgive men their trespasses, your heavenly Father will also forgive you. But if you do not forgive men their trespasses, neither will your Father forgive your trespasses.” So…build a bridge and get over it! You can’t afford to let that thing linger, because you do not know the day or time when God will call you home my friend. Unforgiven things in your heart cut your ability to love and be loved, to forgive and be forgiven. Mend your broken fences, patch up your relationships, and move forward. There’s not a thing on this earth that is worth ruining your relationship with God. Now, lest someone gets some cockamamie idea that this is all because someone has spread gossip my way or there’s some little thorn in my side started by gossip, I’m going to tell you up front – nope. It’s just God delivering a message through me. When I prayed this morning, I asked Him to use me to His glory, and he immediately started talking about this verse. So if this didn’t set well with you, talk to Him about it. As they say, don’t shoot the messenger. He’s a God of love, and His message spoken (or in this case, written) in love as well. I still love my hometown, every single one of you, because you all make it what it is. When we hurt, we all hurt. When we celebrate, we all celebrate. That’s how God designed the body of Christ to be.